Wanna know what I made with that Perfect Pie Crust recipe I shared with you the other day? 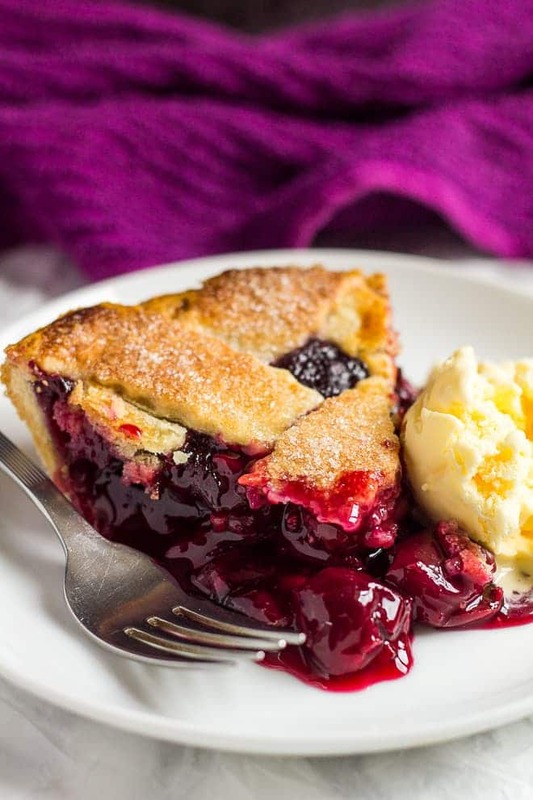 Yep – cherry pie! Totally from scratch, sweet Cherry Pie. 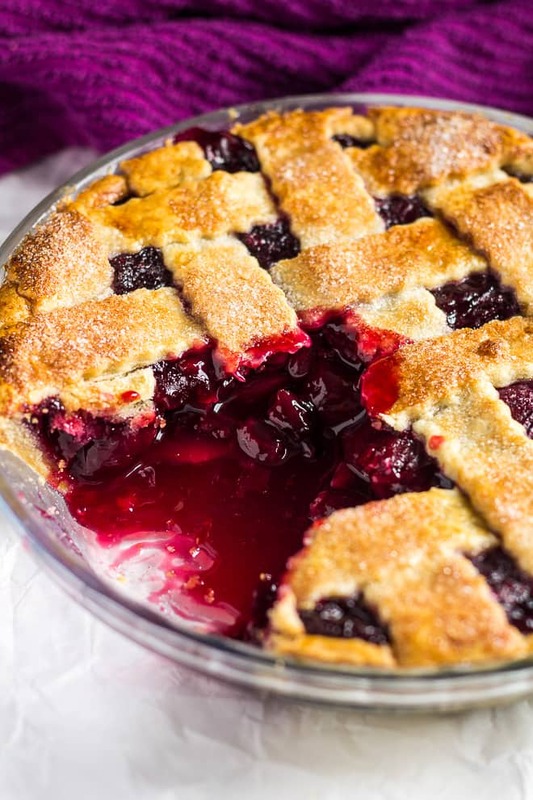 To make my Homemade Cherry Pie, you’ll need to go make my pie crust first, up to step three. OR, if you must, buy two crusts for top and bottom of the pie. Next, the cherry filling. 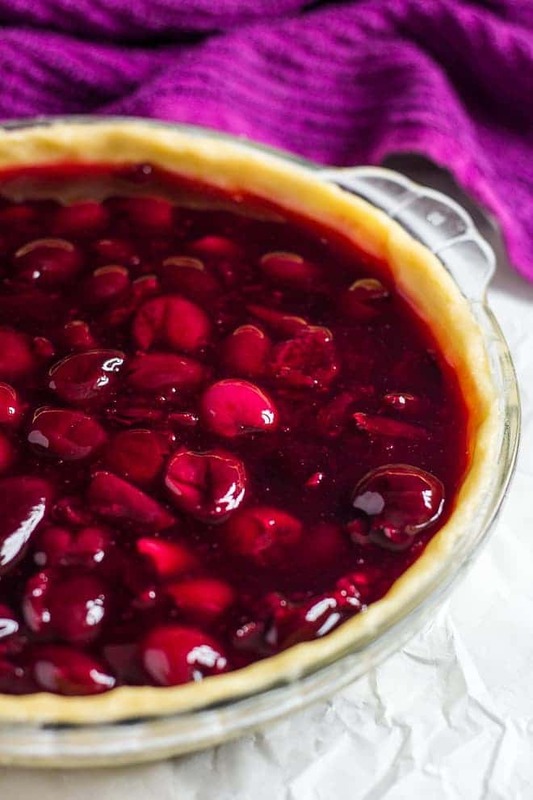 In a large saucepan over medium heat, combine the cherries, sugar, cornflour, lemon, vanilla, and almond extract. Bring to the boil, stirring often, and cook until the cherries start breaking down and the mixture has thickened. Remove from the heat, and allow to cool completely. Roll out the other half of the dough, and using a pastry wheel or sharp knife, cut into strips. 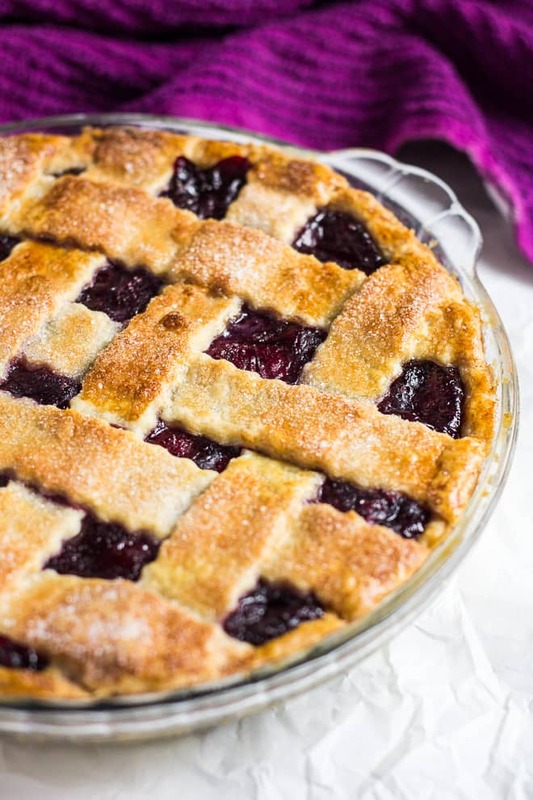 Create a lattice top over the filling. Brush on some egg wash, and sprinkle with sugar. Now it’s time to bake! 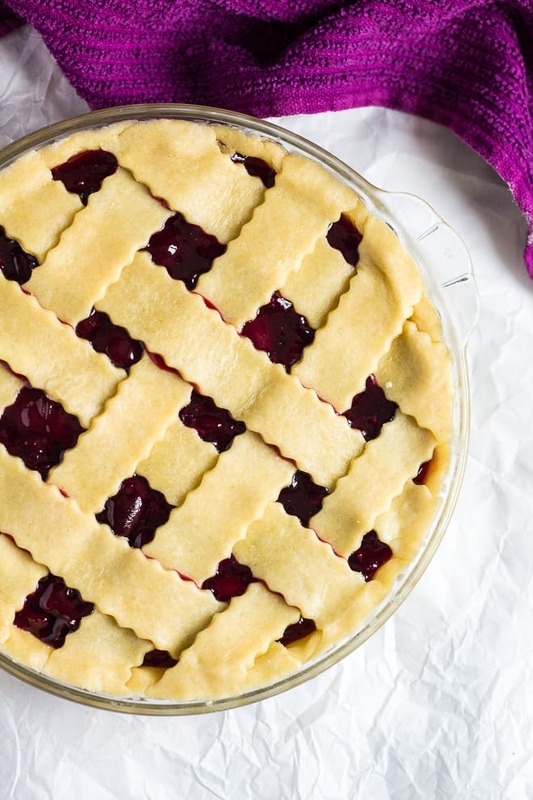 Let the pie cool completely at room temperature before slicing and serving. Serve with a scoop of vanilla ice cream or a topping of your choice! How long will this cherry pie last? 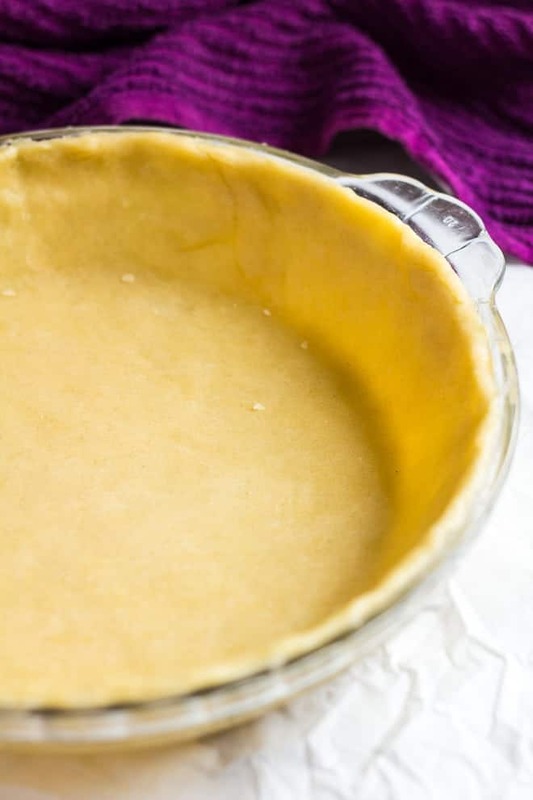 This pie can be covered tightly and stored in the fridge for up to 5 days. Can I freeze this cherry pie? Yes, this pie also freezes well for up to 3 months. Thaw overnight in the fridge, and allow to come to room temperature before serving. More pies & tarts to try next! 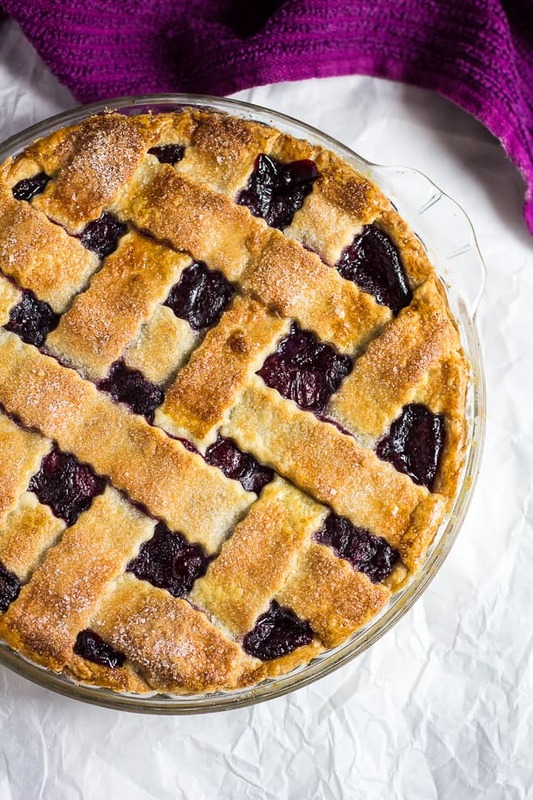 Deliciously sweet cherry pie made with a flaky, all-butter crust, and a homemade cherry filling! 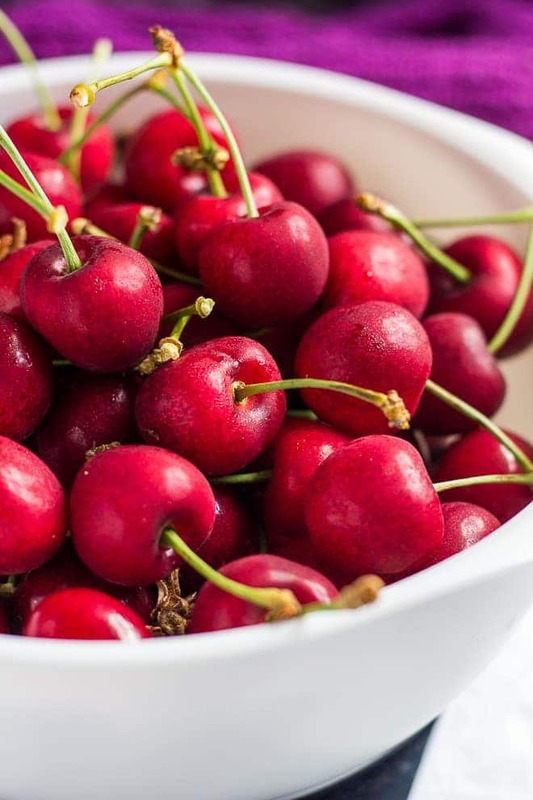 Place the cherries, sugar, cornflour, lemon juice, vanilla, and almond extract into a large saucepan over medium heat. Stirring often, cook for about 10 - 15 minutes until the cherries start to break down, and the mixture has thickened. On a floured surface, roll out one of the discs of dough to a 12-inch circle. Carefully press the dough into an ungreased 9x2-inch pie dish. Spoon the filling into the crust. Roll out the other disc of dough to a 12-inch circle. Using a pastry wheel, or sharp knife, cut out strips of dough. Carefully thread the strips over and under one another on top of the filling. Cut off any excess dough, and seal the strips into the bottom crust. Brush the pastry with the egg wash, and sprinkle with sugar. Place the pie onto a baking tray, and bake for 35 - 40 minutes until the crust is golden brown. 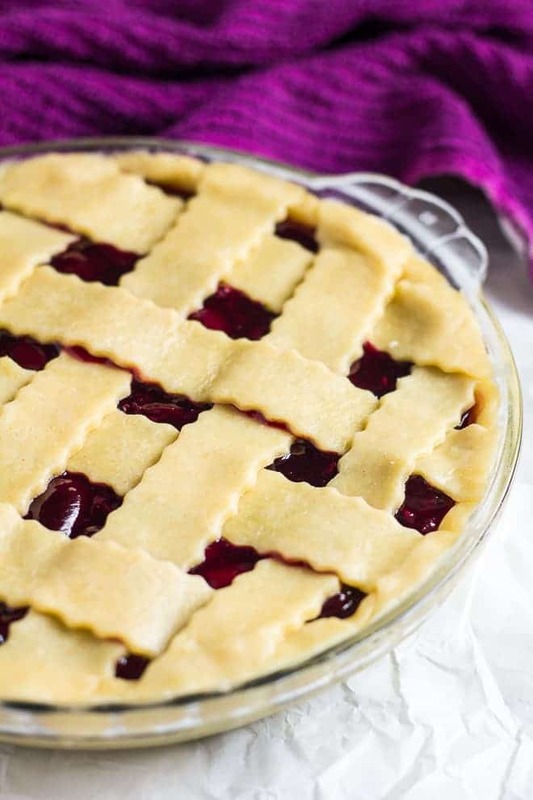 I made a cherry pie recently too, but it doesn’t look as good as yours! OMG, PERFECTION! 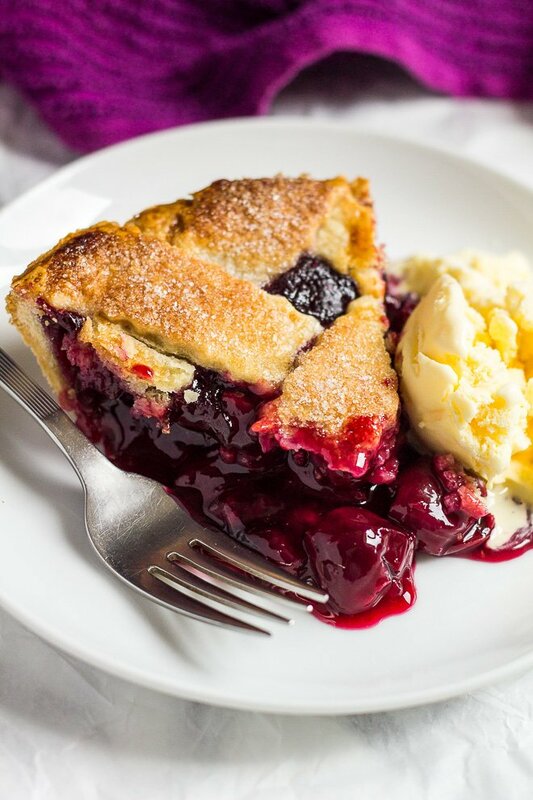 There’s just nothing better than a slice of cherry pie! Beautiful crust and beautiful Cherry pie!!! Just stumbled across your blog. These cherry pie look awesome. Just added you to my reader list – I look forward to following! This looks delicious. Can I substitute frozen dark cherries and do I have to change anything in the recipe? Oh my word! This pie was amazing!! 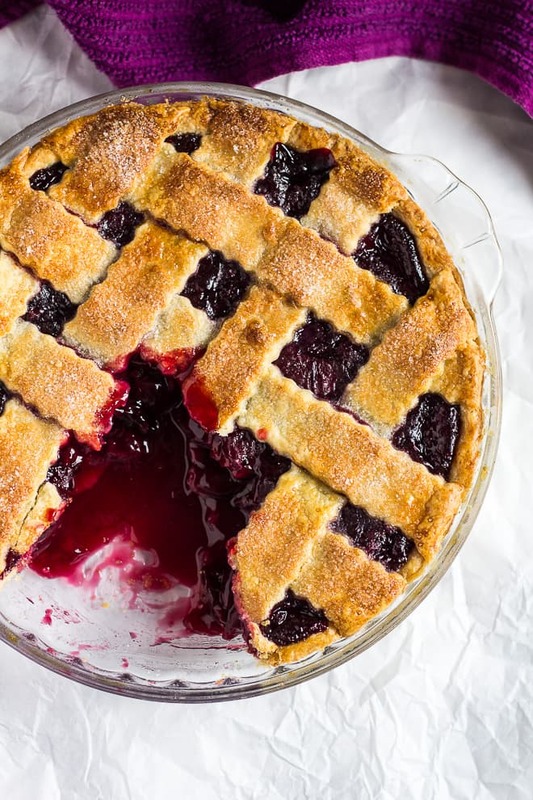 I LOVE cherry pie and will never look at the Comstock pie filling can the same way again. This was definitely worth the time and effort. Thank you so much for posting! Can this be refrigerated for a night then baked the next day? I wouldn’t suggest refrigerating the pie dough with the filling as it may become soggy. You can keep the baked pie in the fridge overnight, or you can store the dough and filling separately in the fridge, ready to assemble and bake the next day. Enjoy!